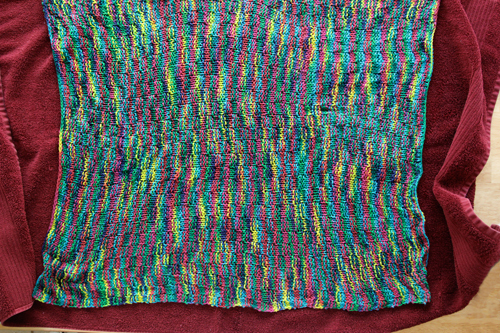 Blocking is something I took years to start doing with finished knitting projects. Just like test swatches. 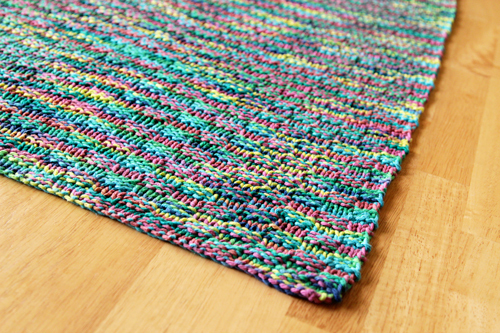 It turns out that both can be pretty important as your knitting gets more sophisticated. Especially if you are making a wearable item, testing your yarn by knitting a sample swatch and blocking it is how you’ll establish a good fit. 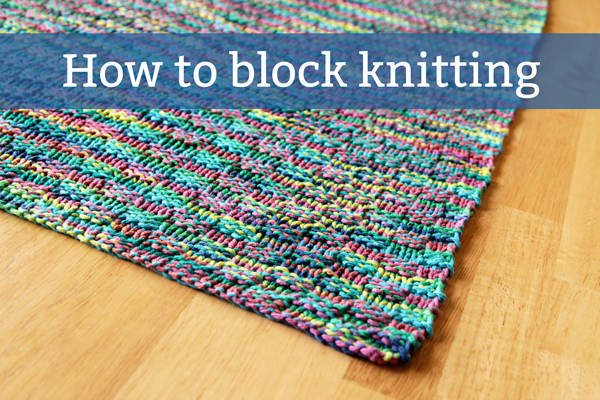 Here are the basics of how to block a knitting project. 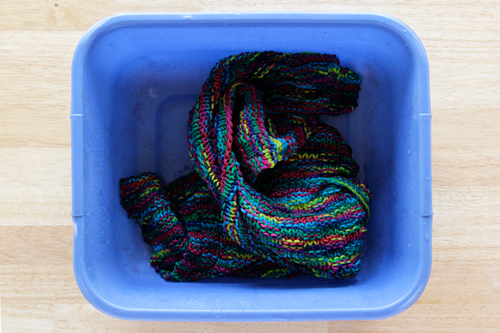 The finished knitting project was given a special bath to set the color. If you’re not worried about setting the color, you can simply soak your knitting in a bath of tepid to lukewarm water with the wool wash of your choice. 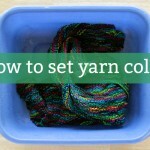 Stir around your project in the bath to get the wool wash into the yarn. Let soak for 30 minutes. Full disclosure: Since I already soaked my knitting in a vinegar bath for 30 minutes, and since I used a simple cotton yarn instead of a wool, I skipped the wool wash, but I normally use it otherwise. When the half hour has passed, gently squeeze out the excess water, but do not wring it out. 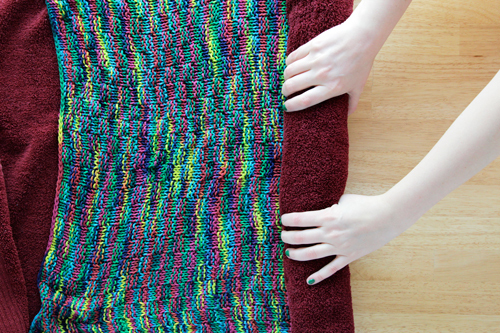 Lay out your project on a towel. I always use a dark towel like this old maroon one, particularly when I haven’t done the colorfast bath, in case some color bleeds. 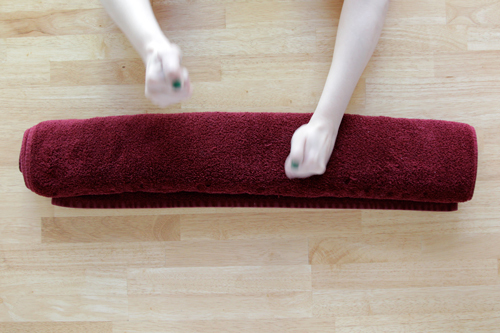 Roll up the knitting in the towel like a burrito. 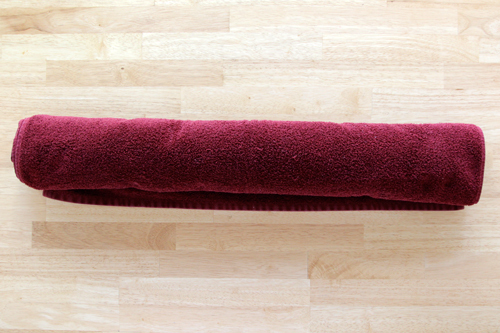 Pound all over your towel burrito, then turn it 90 degrees and pound all over it again. This gets out the excess water without wringing it, which can damage your knitting. Next, lay out your work on a flat surface. If you need to use a blocking board and pins to set it to specific dimensions, you can do that. Since this is just a cotton baby blanket, laying it square was all I needed to do. I will try for the next project, with the help of your post ! Excelente este articulo me encanta lo voy a poner en practica con mis trabajos. I feel so dumb, I always thought blocking was done with an iron and a damp towel. You’re 100% smart! 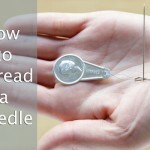 There’s more than one way to block a knitting project: http://www.knitty.com/ISSUEwinter02/FEATdiyknitter.html This is just my preferred way :).